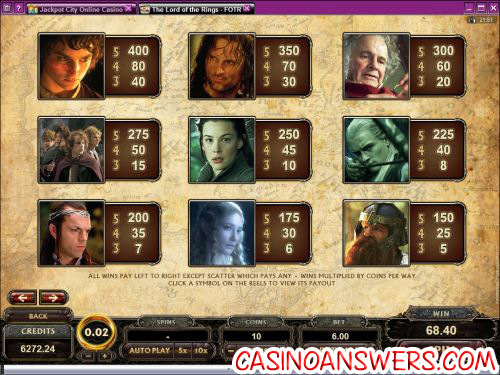 Lord of the Rings: The Fellowship of the Ring Video Slot Guide & Review - Casino Answers! Lord of the Rings: The Fellowship of the Ring is a 5-reel, 243-way video slot developed by Microgaming, featuring stacked wild substitutes, expanding wilds, scatter wins and a free spins feature. You can play the Lord of the Rings video slot game at Jackpot City Casino and Gaming Club Casino. Bets on the Lord of the Rings: The Fellowship of the Ring slot machine are $0.01, $0.02 and $0.05. You can bet 1-20 coins. Due to the fact that the Lord of the Rings slot machine is a 243-way slot rather than a payline slot, you do not have the choice of modifying your number of lines for each spin. You can bet as little as a penny per spin up to $30 per spin, which is not a very large betting range. To bet all 20 coins on a spin on the Lord of the Rings video slot, hit the “Bet Max” button. For other bets, use the “Spin” button to play. The Lord of the Rings symbol is the wild symbol on the Fellowship of the Ring slot game. It is stacked both in free spins and the regular slot game. It will substitute for all symbols in the LOTR online slot machine except for the Ring scatter symbol and the expanding wild symbol. The Sauron symbol is an expanding wild on the Lord of the Rings: Fellowship of the Ring slot. If the Sauron expanding wild symbol lands on the third reel, it will expand to make the entire reel wild. This can help create winning combinations, especially if you get at least one regular wild symbol on reel 2, guaranteeing yourself a winning combination. The expanding wild symbol only appears in the regular slot game and will only expand if there are available wins. The scatter symbol on the Lord of the Rings video slot is the Ring symbol. 2, 3, 4 or 5 Scattered Ring symbols anywhere on the reels will pay out 1X, 2X, 10X or 100X your total bet respectively. Also, if 3 or more Scattered Ring symbols land anywhere on the reels, you will win 15 free spins. During the free spins feature, a random reel will be turned wild. Free spins can be re-triggered. The free spins feature is the best way to win big when playing the Lord of the Rings casino game at Jackpot City Casino! One of the key features of the Lord of the Rings slot game is its Cinematic Spins feature. While there is no gameplay benefit to the Cinematic Spins feature, it does add a load of presentation to the Fellowship of the Rings slot game. When turned on, whenever the reels are spun, you will see a brief atmospheric shot of one of the beautiful landscapes and settings from the movie. The Lord of the Rings trilogy is largely defined by the landscapes of Middle-earth, as seen whenever you spin the reels on this video slot! Cinematic Spins can be turned off in the game options. All wins on the Lord of the Rings slot game pay left to right, except for scatter wins (which pay any). Wins multiplied by coins per way. Scatter pays any. Scatter wins are added to way wins. Scatter wins are multiplied by the total bet. All bets played on the free spins feature are the same as those that started the feature. After hitting the “Expert” button, you can access the autoplay mode on the Lord of the Rings video slot. You can play 5 or 10 autoplay spins or hit the “Auto Play” button to enter the advanced settings. You will be able to set the spin settings (number of spins) and stop settings (stop once spins are complete or stop when a win exceeds or equals your chosen amount). You can stop autoplay at any time. Microgaming has done an excellent job of bringing the Lord of the Rings movie into video slot form, much the same as Peter Jackson and crew took the Lord of the Rings novel to the silver screen. The downside of the Lord of the Rings video slot might be that many would expect a few more features such as a bonus game on a slot game such as this. If you’re a fan of the books, the movies or you just want a fun video slot to play, we definitely recommend you check out the Lord of the Rings video slot at Jackpot City Casino! Are players from the United States able to play the LOTR video slot for real money? Unfortunately, American players are not able to experience the thrill of the Lord of the Rings video slot in real money play. For a selection of great USA-friendly video slots, please check out Slots Oasis Casino and read our Slots Oasis Casino Review. Is there a Lord of the Rings Flash game available to play for free? Yes, you can play a Flash version of the Lord of the Rings advanced slot machine game at Jackpot City Flash Casino or Gaming Club Flash Casino for free or for real money. This is the best way for Macintosh players to play the LOTR slot game. If you experience problems with the Flash casino software, try downloading the latest version of Adobe Flash Player and installing it on your computer. What is a 243-way video slot? A 243-way video slot is a video slot that pays in ways rather than paylines. What it means is that if you have a matching symbol on the top position of reel 1, bottom position of reel 2 and middle position of reel 3, it will still count as a winning combination rather than the symbols having to be in a specific pattern. This opens up more chances for the player to win. For more 243-way video slots, please read our Ghost Pirates Video Slot Review, Archer Video Slot Review, Alaskan Fishing Video Slot Review and Thunderstruck II Video Slot Review. What are stacked wild symbols? Stacked wilds are when a wild symbol can appear on the top, middle and bottom position of a reel. It is similar to an expanding wild (which covers the entire reel), but it won’t always cover the whole reel. A stacked wild may sometimes only appear on one of the positions on a reel. Where can I read more reviews of slots based on movies? Where is the best place to play the Lord of the Rings slot? 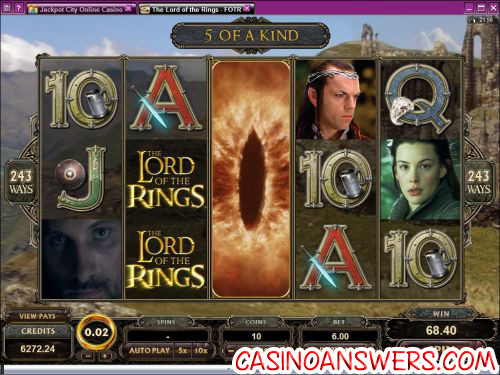 Where can I play the Lord of the Rings casino game for free?